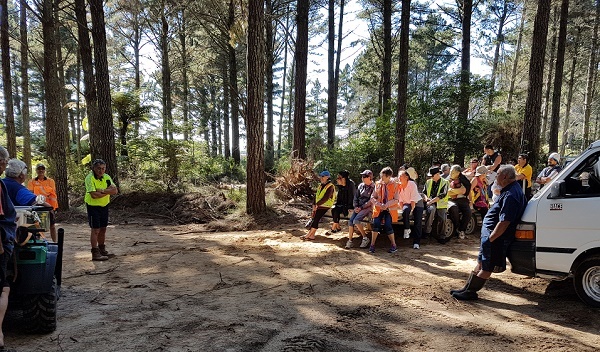 On Sunday the 26th of February approximately 50 people gathered for a Karakia and ceremonial felling of the first tree on Rangiwaea Island in the Tauranga Harbour. The forest is owned by the Tauwhao Te Ngare Trust. The Karakia was performed by their local Kaumatuas Bob Rolleston and Kelly Palmer. Brendon Taingahue (farm/orchard manager in hi-viz) speaking. Bob Rolleston middle and Phil Gardiner (Trust Chairman) on the right. Grant Cleaver from PF Olsen explained the process for resource and archaeology consents, as well as the construction of the infrastructure. Willy Tukaki will undertake the harvesting with his crew. Willy is from Rangiwaea and is claimed as whanau to Rangiwaea Island. Mike Diamond is a forest consultant engaged to project manage the harvesting and re-establishment process. Mike facilitated the team that selected PF Olsen as the harvest manager. Mike says PF Olsen was selected “because of their experienced and competent staff, as well as the company’s background, history, and support services”. Mike thought their health and safety and environmental systems were right up there with the best. The day went very well with positive feedback from those in attendance. A field day is planned when harvesting is underway. 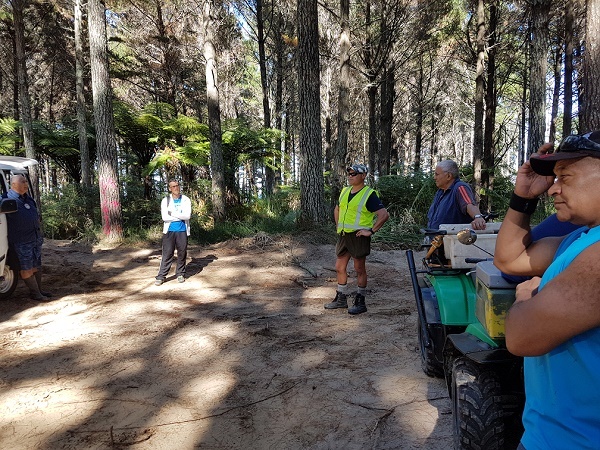 PF Olsen is honoured to be working with Tauwhao Te Ngare, and look forward to the successful completion of this interesting project.